During your cruise you will enjoy the beauty of the Greek Islands, but you will also taste some of the nicest homemade dishes of the Mediterranean cuisine. When we started our cruises in 2004, Thanos’ idea was that a breakfast and a basic lunch will be included. However Alicia took this a step further with her love for cooking, so now many of our guests call our crewed yacht charters ‘gourmet cruises’!!! The secret? Alicia’s cuisine is a fusion of dishes from the Mediterranean countries, always using fresh organic products and of course our homemade extra virgin olive oil. Breakfast every morning is buffet style and the lunch is served al fresco every afternoon, while we are anchored in a secluded bay for swimming and snorkeling. It is served tapas style with a variety of appetizers, salads and main dishes in the middle of the table, so everyone can help themselves to whatever they like. Lunch is accompanied by a carefully chosen local wine or a cold beer. Below you will get an idea of Alicia’s recipes, but please keep in mind that there is not a set menu and the dishes you will have on a specific cruise depend on the month of the year and the sailing area, as they are made with local seasonal products. From the nice aromas coming out of the galley in the afternoon everyone onboard is trying to guess what the meal will be, but it’s not until lunchtime that we find out! Alicia has been the full time chef/hostess onboard our first yacht Alexandros from 2005 until 2009 and on our bigger yacht Velos from 2010 until 2017. However from 2018 she will be onboard Velos only a few weeks per season as we now have a little baby, but Alicia's recipes are prepared by the chefs/hostesses on both our yachts as they have been trained by her. 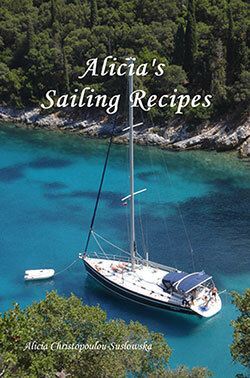 In 2016 she published her 85 page recipe book which contains all her recipes accompanied by many photos and if you like the cuisine onboard you can take a book back home with you, as there are plenty of copies on both our yachts. If you have any food allergies or intolerances it is not a problem, but it will be great if you could let us know in advance so we can accommodate for that. Our Greek Island cruises are half-board and if you decide to spend one or more nights in a secluded bay, you can also have your dinner onboard for a cost of 30 Euro per person, minimum 4 people (sundowner cocktail, appetizers, main dishes, wine or beer and desert). vegetables and fruit: most are grown at Thanos father's garden who sends them to us every Saturday! Fresh fruit - variety depends on the season: figs, grapes, honey melon, watermelon, peaches, apricots, nectarines, plums etc.